You might remember that a day after our final troops pullout from Iraq, its Shiite-led government had issued an arrest warrant for its Sunni vice-president, Tariq al-Hashemi. So then, Mr. Hashemi was holed in the Kurdish controlled zone until this April when he traveled to Qatar. Of course, Iraq demanded that Qatar hand over its fugitive Vice-President after he began what the emirate described as an “official visit”. Mr. Hashemi who is now in Turkey has denied his alleged involvement in the murder of six judges and other officials. EuroNews quoted him as saying that the charges are politically motivated and he refused to stand trial in Baghdad. Al Arabiya reported that he refused to return to Baghdad to face charges because he says the courts are biased. Mr. Hashimi, has, however offered to stand trial in Kirkuk where Kurds and his fellow Sunni Arabs hold sway. According to Reuters, on May 8, the Interpol called for the arrest of fugitive Iraqi veep at the request of Iraqi authorities. LYON, France – At the request of Iraqi authorities, INTERPOL has published a Red Notice for Iraq’s Vice-President, Tariq Al-Hashemi, on suspicion of guiding and financing terrorist attacks in the country.The Red Notice for Al-Hashemi represents a regional an international alert to all of INTERPOL’s 190 member countries to seek their help in locating and and arresting him, following the issue of a national arrest warrant by Iraq’s Judicial Investigative Authority as part of an investigation in which security forces seized bombing materials and arrested individuals. 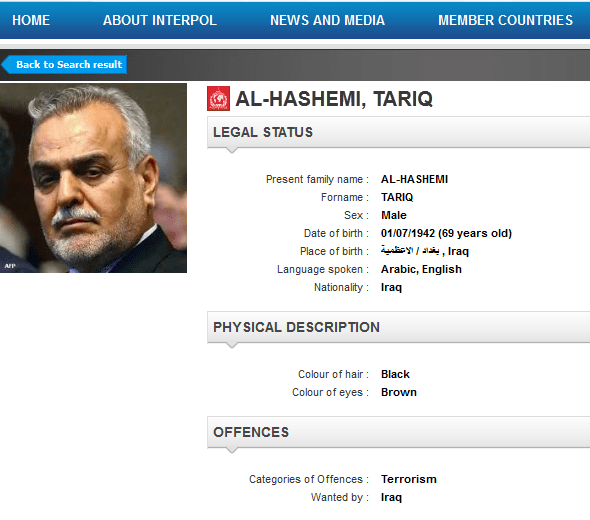 The publication of the INTERPOL Red Notice for Tariq Al-Hashemi will see INTERPOL’s Fugitive Investigative Support unit and the Command and Coordination Centre at its General Secretariat headquarters closely liaise with its National Central Bureaus in the region and worldwide to pool and update all relevant intelligence. The original Red Notice is here. One more installment in our democracy project in Iraq. The Samuel J. Heyman Service to America Medals (Sammies) pay tribute to America’s dedicated federal workforce, highlighting those who have made significant contributions to our country. According to the Partnership for Public Service, the honorees are chosen based on their commitment and innovation, as well as the impact of their work on addressing the needs of the nation. The 2012 finalists include three nominees from the State Department. This award will recognize a federal employee whose professional achievements reflect the important contributions that a new generation brings to public service. This medal is accompanied by a $5,000 award. Achievement: Overcame numerous obstacles during the Arab Spring uprisings to ensure that U.S. diplomats in the Middle East could securely dispatch and receive classified documents and equipment. This award recognizes a federal employee for a significant contribution to the nation in activities related to national security and international affairs (including defense, military affairs, diplomacy, foreign assistance and trade). This medal is accompanied by a $3,000 monetary award. Achievement: Leads the effort to prepare the staff at U.S. embassies and consulates to help protect and evacuate Americans caught up in uprisings, wars and natural disasters. Achievement: Created innovative social media and online platforms for State Department employees around the world to collaborate, share information and connect with important outside audiences. The finalists are contenders for nine Service to America Medals, including Federal Employee of the Year. Medal recipients will be announced on September 13 at a Washington, D.C. black-tie gala. Read more about the Sammies here.